Besides selling complete new computer systems, Madison Geeks can upgrade your existing PC with new hardware or peripherals. We'll review your current setup and offer solid solutions, no heavy sales talk. Upgrades can be done on site or in our shop. For on-site work, just contact us and we'll setup an appointment to be there when you need us. If you need help we will also provide training in the use of your new hardware or software. Adding more memory will enhance system performance at a low cost. We work with the world's leading memory suppliers to identify the correct part for your machine. If you find you're running out of hard disk space, a new disk drive with more storage space can extend the life of your computer or laptop. We recommend an upgrade to an SSD Solid State Drive for your main drive over HDD Hard Disk Drives. If you do a lot of work with photos and videos, you may want to opt for an HDD as you can get a larger drive for a lower price. It's best to have your operating system running from and SSD for a variety of reasons. Your data on your machine is more valuable than the hardware. You do need a solid strategy for backups. We will help you determine the most appropriate backup strategy. 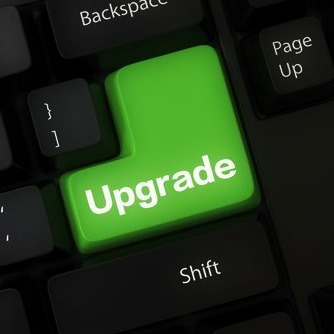 Then choose the right hardware and software upgrade to suit your needs. You need to be running the latest versions of your critical software. We can install and upgrade any software or operating system. We're not limited to just Microsoft Windows. We have a number of avid Linux customers.